Hira is a cave. It is on the Arabian Peninsula. 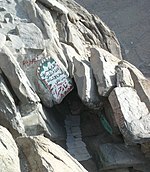 Mohammad lived in this cave for forty days. Muslims believed that God spoke to Mohammad in Hira through angel Gabriel. This page was last changed on 9 March 2013, at 01:51.